The Place When you see pictures of Fann Wong and Christopher Lee with the owners, you know it can’t be that bad. Sun May Hiong Satay House is an old establishment in Melaka which is very popular amongst locals. The interior is simple with many tables and everyone is only here for one thing – their satays. The Food The satay starts from RM0.90 per stick with minimum order of 10 sticks with options like pork, chicken, and interestingly pork liver and pork intestine. The kitchen is at the end of the restaurant where a team of workers are grilling the satays over charcoal. 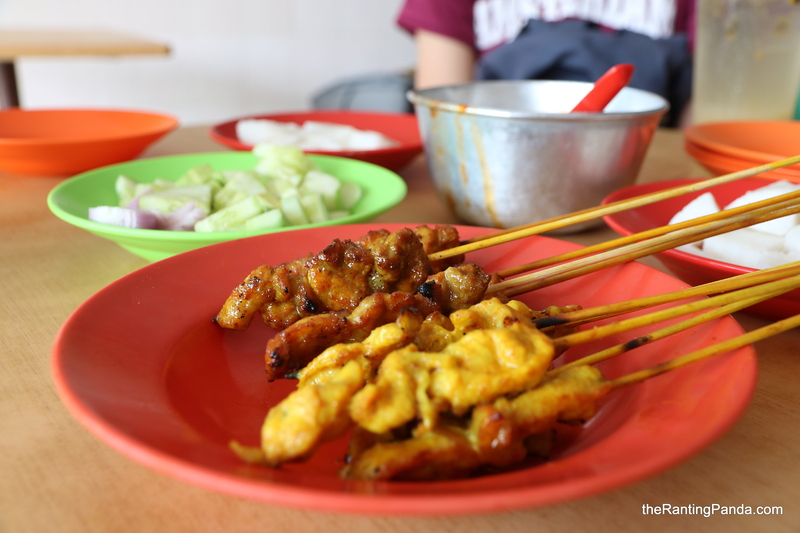 Every order of the satays also come with Rice (RM1.50), along with Cucumber and Onion (RM1). We tried both the pork and chicken flavours, and are impressed by how tender they are. The portions may be quite small for each stick, but it tastes very good upon dipping in the satay peanut sauce. Unlike the typical versions in Singapore, pineapple is added to the sauce here, which tastes like a diluted version of sambal sauce. Yes, the sauce is slightly spicy too which adds to the kick of the overall flavour. Everyone of us are in love with the satay. Rants The restaurant is not air conditioned, and especially with the spicy satay sauce, it may not be very pleasant on a hot day. The good satays make up for it though. Will I Return Again? I enjoyed the satays at Sun May Hiong, and they are easily one of the best I have had. The flavours are unique to the city and nowhere near the ones I had in Singapore before. I will be back for this, and this time, it will be a proper satay meal.